Take ChampionsGate Blvd west. Turn right onto South Goodman Rd (just before the ChampionsGate arch and between the 711 Gas Station and Chilie's Restaurant). Follow South Goodman Rd to the resort. Follow the signs for checkin. ***PLEASE NOTE, you will be required to leave a credit card security authorization (which will be approved for a $300 charge) upon checkin or as an alternative to the credit card authorization you may select to pay the $39 non refundable insurance policy (damage waiver) that covers any damages up to $1500. Please note, the resort also requires all guest to present a valid drivers license upon check in. *** LATE ARRIVAL PROCEDURES Please note, the check in desk at the resort is open until 11pm. If you arrive after that time, you will receive your keys from the guard at the security gate. Please note, all guest arriving after hours MUST formally check in at the front desk the following day before the office closes at 11 pm as the key received from the security guard will only be good for one day. Should you lose your way or need any assistance with the check please call the resort's emergency number at 4077874800. 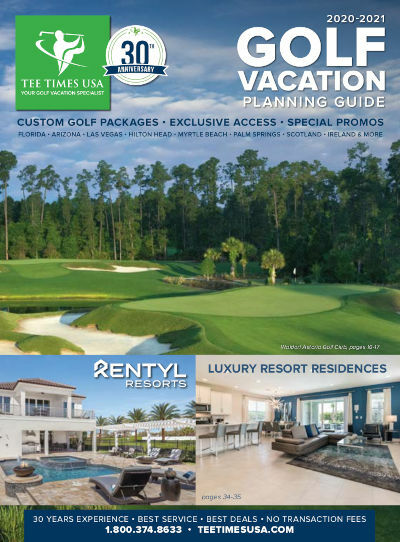 Thank you for reserving your golfing vacation through Tee Times USA. On our most recent trip we stayed at Tuscana Resort and were not disappointed! The three bedroom accommodations were great and within a reasonable driving distance to all of our booked golf courses. Very nice accommodations, they were very nice. The resort was outstanding. Villas were clean and comfortable. We had 2 units, one had old 'Box' TVs. But overall plenty of room and a good value. Very nice accommodations. Great pool. Needs a daily breakfast restaurant. Staff was friendly and very helpful. This is our 3 year returning to the resort. We enjoy the amenities such as WIFI, pool, bar, etc. I recommend to anyone wanting a nice clean comfortable place. Nice place. Pretty close to the courses. As always great accommodations ,rooms always ready and clean., friendly staff. Poolside bar great time ,close to all golf . Will book next year for five years running. We had 21 golfers all had a great stay. This was ourthird stay. Staff was very friendly and helpful. Modern - clean and convienient. Great accomodationwith 2 bedrooms and 2 baths. Accommodations were just what we needed. This place was outstanding. I highly recommend it forfuture golf trips. Very nice rooms. New and clean. Would definitely staythere again. Resort and unit were well kept. Pool area was clean.Would recommend for similar type of vacation. Very nice hotel. Our three bedroom was clean andspacious. If something broke - handyman came right away. Good sizepool and cozy bar. Would stay there again. Beautiful facility 3 bedroom condo was perfect cannotwait to return. Three BR. condo was great - four golfers verycomfortable. All of the staff was great especially at the poolbar where we spent too much time - easy check in. Condo closeenough to all golf and restaurants. Already planning to come backnext year. First rate - clean - convenient and friendly staff...Iwill stay there again. Very nice facility - staff friendly and helpful. If you have stayed at Tuscana Resort, we would like to hear from you. Tuscana Resort is located in the heart of Orlando's premier golf community at ChampionsGate, only two exits away from Disney World and with easy I-4 access to many top Orlando golf courses. This unique, gated Mediterranean-style resort offers a tastefully decorated clubhouse featuring a large beach-style heated pool and sun deck that is surrounded by shaded cabanas and large Jacuzzi, 25-seat movie theatre, conference room, business center, computer kiosk and fitness center. Tuscana Tavern is open for dinner and the pool bar is open each evening featuring live telecast for major sporting events. The resort offers recently renovated two and three-bedroom spacious suites that are decorated and designed for entertaining or relaxing. Each unit has two full baths, a large dining table and complete kitchen appliances, dishware, a large washer and dryer, screened porch with table and chairs, laminate flooring and in-room hard wired Internet access. All you will need to complete a perfect golf vacation! Daily maid service is not included but can be arranged for an additional fee directly at the resort. Special resort policy: The resort will not issue any refunds for no shows or early departures. A mandatory resort amenity fee of $19.00 plus tax per villa per night will be added to your reservation and includes: playstation 3 console in each unit, unlimited access to movies and PlayStation game rentals, in-room WiFi access, in-room safe, in-room coffee and tea starter kit, use of the fitness and business centers, pool towels, parking, BBQ grills, picnic tables, shaded pool cabanas and unlimited local and toll free calls. A departure fee of $60 plus tax per stay in a 1 or 2 bedroom villa and $70 plus tax per stay in a 3 bedroom villa will be added to your reservation. Tuscana Tavern Restaurant will be temporarily closed for renovation starting January 20, 2019. Re-opening date is currently to be determined. Guests may choose from a variety of restaurants that are within a mile of Tuscana.